Barcelona has a big chance of getting into the semi-finals of the UEFA Champions League for the first time since the title in 2015. 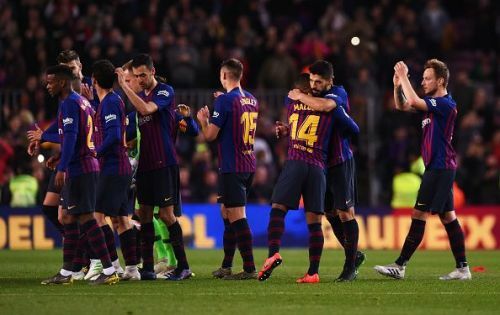 Barcelona snatched a crucial away goal, courtesy of a Luke Shaw own goal, and secured the victory in the first leg of the UEFA Champions League match held at Old Trafford last week. Barcelona have a glorious opportunity of qualifying to the semi-finals of the UEFA Champions League for the first time since 2015. The Catalans hold a 1-0 lead over Manchester United after the first leg of the fixture courtesy of an own goal by United left-back Luke Shaw. The biggest positive on the Catalans side is the home advantage coming into the second leg. To understand how big a task is ahead for Manchester United you have to understand that the Blaugrana are undefeated at the Camp Nou for the past 6 years. The last time they tasted defeat at the Camp Nou was at the hands of Bayern Munich way back in 2013, when Arjen Robben ran riot in the Catalan capital. Since that night Barcelona have turned the Nou Camp into an impregnable fortress. They have gone 30 matches without losing at the Camp Nou, winning 27 of them. In all the 30 matches, Barcelona has scored an eye-catching 93 goals while conceding just a mere 15. Another factor that helps Barcelona is that their talisman Lionel Messi shines brightest at the Camp Nou. The Argentine has scored an impressive 31 times at home and provided 11 assists in 26 European home matches since that day. Barcelona will face Real Sociedad at the end of the week after their crucial UEFA quarterfinals match against Manchester United in mid-week.